In two day’s time, on November 11th 2018, the armistice that ended the westerns Allies’ war with Germany will be remembered. Negotiation of the terms had been underway since November 8th and though the terms were argued over there was no doubt that an agreement would be reached. It was therefore especially tragic that hostilities would continue in these last days – and even last hours – and that lives would be lost and families devastated. It was in the two final days, November 9th and 10th 1918, that the Royal Navy would suffer its last losses of the war, the 17,500-ton pre-dreadnought battleship HMS Britannia and the 810-ton minesweeper HMS Ascot, taking with them over a hundred lives. These vessels were the last of 169 warships lost by the Royal Navy during the war, ranging in size between torpedo-boats and super-dreadnoughts. Further losses were sustained by the huge number of civilian craft, from sailing trawlers to ocean liners, taken into service to undertake duties as varied as U-Boat decoys (“Q-Ships”), minesweepers, escorts, transports and hospital ships. Yet more appalling were the Royal Navy’s human losses – according to one source a total of 34,642 dead and 4,510 wounded. The most spectacular losses were those incurred in a few hours when the main British and German fleets met at the Battle of Jutland in 1918 – 6094 dead and 674 wounded. Dreadful as these were, they did however represent a small part of the total. 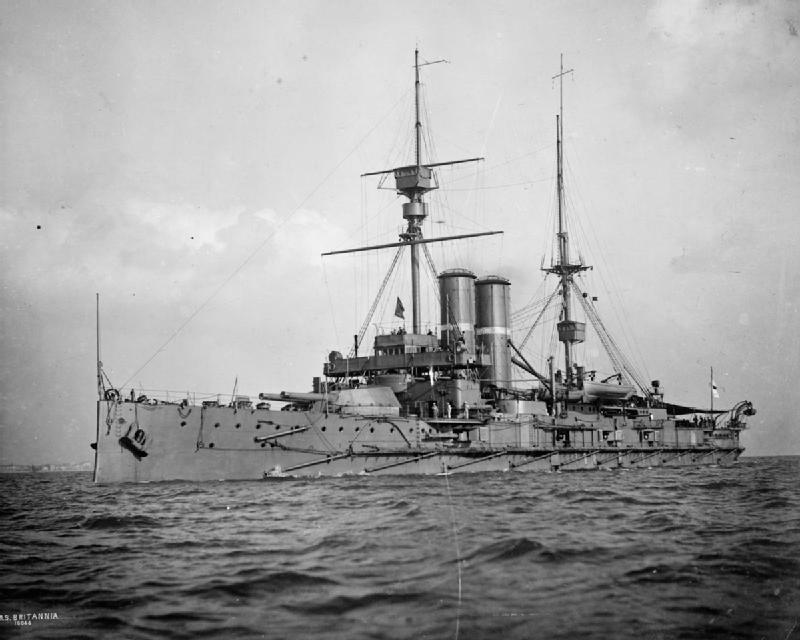 The greater part of the total losses was however sustained in a slow but continuous series of lesser – and sometimes very small scale – actions that began on the second day of the war with the sinking by mine of the cruiser HMS Amphion. HMS Britannia’s loss on the third-last day of the war marked the end of the pre-dreadnought era. Already obsolescent when launched in 1904, she and her sisters were to be wholly outclassed when HMS Dreadnought, the first modern battleship, was commissioned two years later. These vessels belonged to the eight-member King Edward VII class. Because they carried a very heavy secondary armament of four 9.2-inch guns and ten 6-inch weapons, in addition to the classic “four 12-inch” main armament of British pre-dreadnoughts, they were subsequently labelled “semi-dreadnoughts”. Bristle with guns as they might, the difficulty of distinguishing between 12-inch and 9.2-inch shell splashes made fire-control a nightmare. Uses were however found for them during World War 1, including being placed in the head of columns of dreadnoughts in the North Sea early in the conflict, so as to be the first to strike mines and thereby spare the more valuable ships following. The crews cannot have enjoyed this work. Some served thereafter in the Mediterranean and in other areas and until 1918 only one, HMS Edward VII herself, was lost when she struck a mine off the north of Scotland in early 1916. On the morning of November 19th 2018 – a hundred years before the date of this blog – HMS Britannia was located off Cape Trafalgar by the German submarine UB-50. This craft had operated out of the Austro-Hungarian base at Pola, on the Adriatic, and in her fifteen-month career, beginning in September 1918, she had already sunk a total of 37 vessels, totalling almost 80,000 tons. HMS Britannia was to be her last victim. UB-50’s torpedo attack resulted in a first explosion that left the semi-dreadnought heeling ten degrees to post. A second explosion started a fire in a 9.2-inch magazine, a mercy being that this resulted in slow-burning cordite rather than a catastrophic explosion. 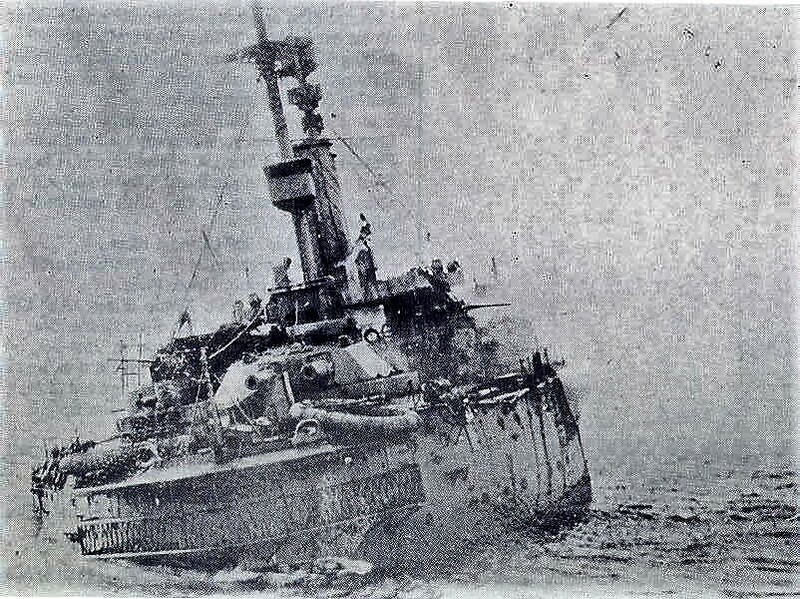 Though doomed, HMS Britannia remained afloat for the next two and a half hours, during which 612 of her crew were taken off by accompanying vessels. The 50 dead and 80 injured were mainly due to inhalation of toxic smoke from the magazine fire. HMS Plumpton of the Racecourse Calss, similar to HMS Ascot. Note paddle-wheels. The Royal Navy’s last loss of the war was to be sustained the next day, November 10th 1918. The vessel involved was in stark contrast as regards size with HMS Britannia. Launched in early 1916, the shallow-draughted HMS Ascot was a small Racecourse Class paddle minesweeper, just over 800-tons and 235-feet long. Of a type for which a need had not been identified before the war, she and her sisters had played a crucial role in keeping the approaches to British ports open. She too was to fall victim to a U-Boat, in this case the UB-67, when she was found off the Farne Islands on England’s north-east coast. Small as HMS Ascot was, her crew lost one more man than the much larger HMS Britannia when she took her entire crew of 51 men to their deaths. And the next day the war ended. That HMS Ascot’s loss was the Royal Navy’s last of the war can have been little comfort to the families of her crew. Let us remember them, no less than the servicemen they loved, when the Armistice is commemorated on the coming Sunday, November 11th.